Benign tumors can exist in a dormant state, which can be driven by inadequate access to sufficient blood supply. However, the "angiogenic switch" occurs when angiogenesis is activated in a dormant tumor and growth factors are secreted to induce sprouting and chemotaxis of endothelial cells toward the tumor mass. Within the hypoxic environment of the tumor mass, hypoxia inducible factor-1 (HIF-1) is stabilized and activates the expression of multiple genes contributing to the angiogenic process, including vascular endothelial growth factor (VEGF) and fibroblast growth factor (bFGF), or platelet-derived growth factor (PDGF). 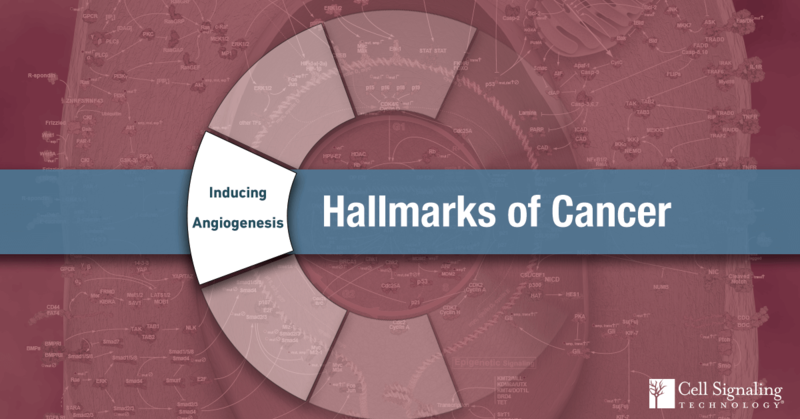 The Hallmarks of Cancer were identified by Doctors Robert Weinberg and Douglas Hanahan and were originally published in Cell1. The authors propose the idea that the complexity of cancer can be broken down to smaller subsets of underlying principles. The information here pertains to one such subset. Other entries in this series explore the other known Hallmarks.